Properties in North Cass average 4.8 out of 5 stars. LEECH LAKE FISHING AND FAMILY FRIENDLY VACATION HOME. Property 2: LEECH LAKE FISHING AND FAMILY FRIENDLY VACATION HOME. Private Log Lodge Nestled In Chippewa National Forest On Secluded Lake. Property 13: Private Log Lodge Nestled In Chippewa National Forest On Secluded Lake. Charming 2BR Federal Dam House w/Great Lake Views! Property 22: Charming 2BR Federal Dam House w/Great Lake Views! 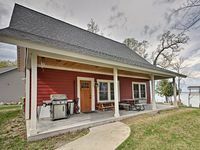 Federal Dam Cabin on Leech Lake-Near Boat Launch! Property 24: Federal Dam Cabin on Leech Lake-Near Boat Launch! Awesome Cabin on Leech Lake with Wooded Views! Property 26: Awesome Cabin on Leech Lake with Wooded Views! Cozy Buck Lake Cabin escape on Cass Lake Chain just minutes from Bemidji!! Property 29: Cozy Buck Lake Cabin escape on Cass Lake Chain just minutes from Bemidji!! Adventure North - Lux 4 BRM & Free 19' Pontoon with Full Week in June. Property 30: Adventure North - Lux 4 BRM & Free 19' Pontoon with Full Week in June. Adventure North - 4 BRM & Free 19' Pontoon w Full Week in June - Stunning Views. Property 36: Adventure North - 4 BRM & Free 19' Pontoon w Full Week in June - Stunning Views. Cabin #1 (Whitetail) Beautiful log cabin situated right on the lake! Property 40: Cabin #1 (Whitetail) Beautiful log cabin situated right on the lake! CABIN #4 (Bear) Beautiful knotty pine cabin tucked back by the woods! Property 41: CABIN #4 (Bear) Beautiful knotty pine cabin tucked back by the woods! CABIN #2 (Wolf) Beautiful log cabin situated right on the lake! Property 42: CABIN #2 (Wolf) Beautiful log cabin situated right on the lake! CABIN #5 (Loon) Cozy and comfortable 1 bedroom cabin with nice view of the lake! Property 43: CABIN #5 (Loon) Cozy and comfortable 1 bedroom cabin with nice view of the lake! CABIN #3 (Walleye) Beautiful log cabin situated on the lake! Property 44: CABIN #3 (Walleye) Beautiful log cabin situated on the lake! This Cabin is very nice, well maintained, very clean!! This is my first time to rent a cabin, This was a GREAT experience!! The cabin was nice and warm when we arrived, it was very clean, no problems with anything. I would recommend this cabin to anyone! Would stay here again!! Hopefully a warmer weekend next time, -28 degrees for the air temperature was too cold!! But the cabin was warm! Our family of 4 stayed at this property to enjoy a quiet vacation in the winter woods. The house is actually even better than the photos suggest. It is equipped with everyone one would need and is very comfortable. It feels very cozy but is also quite spacious. It is in a fabulous location, next to a quiet and private part of the lake, surrounded by forest. The Lake Country trail passes near the house, and this was fun to snowshoe on. Everything about this place is excellent. Highly recommended!